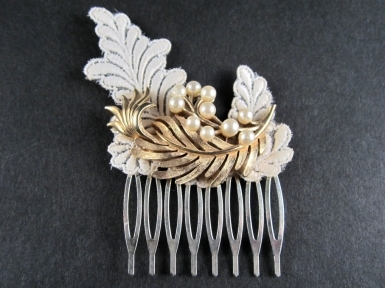 A gorgeous silvertone comb incorporates a vintage goldtontone faux pearl ornament set on antique lace. The 8 prong comb itself is 45mm wide, and comes beautifully presented in a black and gold embossed fur-lined (faux of course!)box. FREE POSTAGE ON THIS ITEM.